The Mt. Olive Cemetery and Abbey in Pittsburg, Kansas is currently operated by the City of Pittsburg. 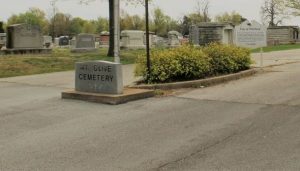 This facility has one full time and one part time employee that maintains the cemetery and abbey. The cemetery sits on approximately 30 acres of land located on east Quincy Street. Lots are available for sale in Mt. Olive Cemetery. If you would like to arrange for a burial in the cemetery, this section provides a pricing structure for spaces and services. Arrangements can be made for funeral services.